Chinese people believe that walnuts are good for our brains, that can help and enhance our memory. For myself, I love eating walnuts simply because of its good taste when it’s used to bake banana cakes. Banana contains much goodies, including Vitamin C, potassium and dietary fiber, any cakes baked with bananas are my family’s favourite. Now bananas are cheaper and on sale everywhere here, so I’ve got lots of ripe bananas for cooking. Excellent! The ingredients and method of baking this Banana Walnut Cake is quite similar to the banana butter cake I shared previously. Baking this kind of cake seems to be a piece of cake without any risks of failure at all. Still, we sometimes find it’s not easy to control the texture to their liking. The key to baking a soft banana walnut cake is quite simple. Don’t over-stir the batter, just incorporate the ingredients together. Do you have any other secrets to bake a perfect banana cake? Preheated oven to 180C (356F). Cream the butter with sugar with an electric mixer until light yellow, about 4 to 5 minutes. Add 1/3 of whisked egg into butter mixture at a time and mix well between adds. Combine thoroughly. Pour in the milk and combine well. Add smashed bananas. Combine well with a spatula or wooden spoon. Mix flour, baking soda and salt together. Sift into the banana mixture and combine well. Sprinkle walnuts and fold in. Reserve some walnuts to sprinkle over the surface of batter. Transfer batter into a baking mould. Bake for 40 to 45 minutes, or until lightly brown and cooked through. Test with a needle. If it comes out clean, the cake is done. Slice and serve on a platter. Enjoy! My secret it to use Christine's recipe! Hehe... looks yummy! Use overly ripe bananas, those that turn black and fir for the bin and use wholemeal flour and add a dash of milk. Healthy tasting, very fragrant and soft like pillow! I miss my banana cake now.. Love love banana cake especially the lovely strong smell of banana when it's baking in the oven! your banana cake looks great! Oh!! I agree banana cake is easy to bake but hard to master. Yours looks so moist! WOW! This is one of my family favourites. Beautiful picture and looks very delicious. Would be so lovely with a cup of hot tea....mmm. Yum - this looks delicious! Banana bread is one of my favorites for a batter dough recipe, and you hit a home run with this one! Always a fan of banana bread/cake. Yum. Looks so yummy! Merry Christmas and Happy New Year to you and your family! yum yum! Love cooking with bananas, so tasty and satisfying! Simply delicious! 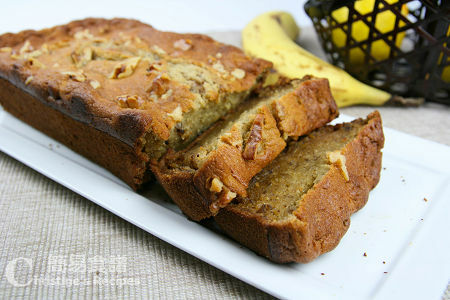 I love banana bread for the breakfast! Lovely -- the kitchen must smell amazing after this has baked in the oven, and what a treat to enjoy for breakfast with coffee or tea. 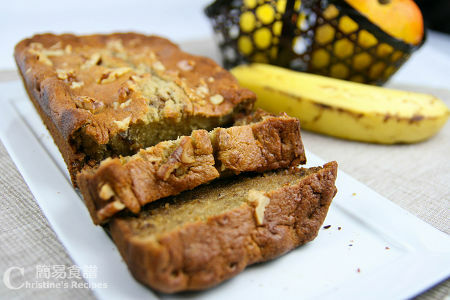 My husband has no self control when it comes to banana cake - I may have to make this just for the reaction =) Looks yummy! If it's in fine form, it can be dissolved and mixed well with other ingredients. Hi. For baking, do we use both the top and bottom heat? My oven doesn't have separate heat elements that can be adjusted to different heat levels. I placed the cake on the middle rack and baked at 180C (356F). When you say melted butter, do you mean butter at room temperature or melted butter as in putting it in the microwave to melt? Yes, this recipe only calls for baking soda, doesn't need any baking powder. May I know what is cake flour? Is it superfine flour? Cake flour is a kind of low-protein flour, different from superfine flour. It helps to produce delicate cake. Can I replce Castor Sugar to molasses sugar? Sure, you can use molasses sugar instead but you need to adjust the amount. I haven't tested this recipe with molasses sugar, so can't tell the exact amount to be used. Feel free to experiment it. May I know on point 3 do you use whisk to combine or spatula like fold in the egg and etc? After adding the flour, I fold in with a spatula. 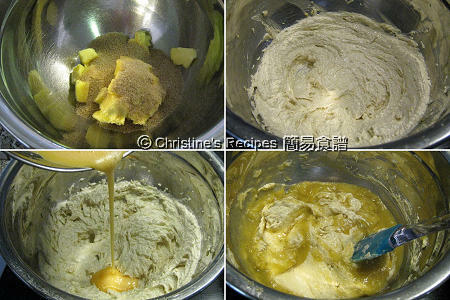 Hi Christine, I realised that you used plain flour for your banana cake recipe but cake flour for banana walnut cake. May I know is there a difference? Can I use cake flour for banana cake recipe instead of plain flour? Do I need to adjust the amount of cake flour? The texture of the cake baked with cake flour will be softer. Yes, you can use cake flour for making banana cake instead. Same amount. I tried this recipe today. OMG, it tastes so Good. Thanks!! This recipe is so easy to make. Thanks for sharing Christine!